Highlights: If To Kill a Mockingbird is an American tragedy, The Ferryman is an Irish tragedy. Specifically, a Northern Irish tragedy. In about 24 hours in the farmhouse of a former IRA member, this story unfolds that is both intensely personal (lots of family drama when 14 family members live in one household) and fiercely political (can one ever be a former IRA member?). The events are kicked off when the body of Seamus Carney is found in a bog, after having been missing for ten years (he's one of "The Disappeared"). This causes much trauma for his widow and 14-year old son, who have been living all this time with Seamus' brother Quinn (both brothers were involved in the IRA), helping to raise his seven children while his wife Mary suffers from various ailments (including perennial pregnancy and likely post-partum depression). So much happens in these 24 hours (which plays out in just over three hours), that it boggles the mind. When it was over, I asked my friend if we could see it again (we couldn't, we were leaving the next day). Between the Irish accents, the 22 named characters in the play, and the complicated political and familial issues, there's a lot to take in. I don't read plays, but I just ordered the script so that I could read and study it. 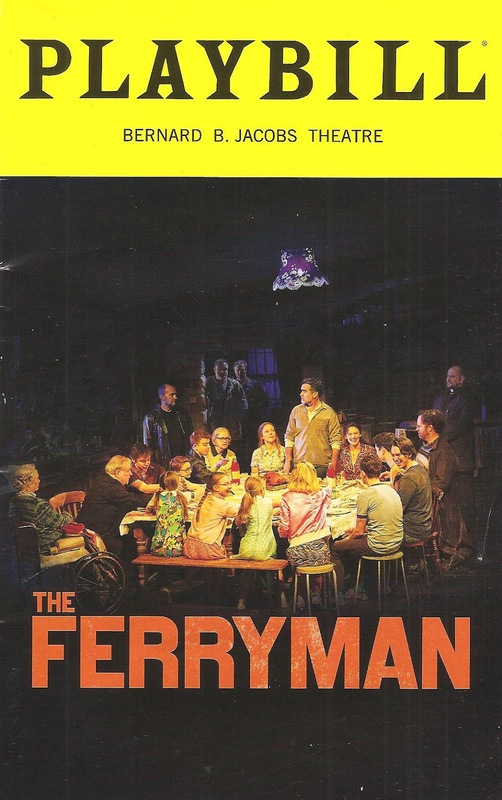 The Ferryman premiered in London in 2017 (where it was very successful, both with critics and audiences), and most of the original cast transferred to Broadway last fall. In February of this year, most of them left to be replaced with an American cast, and it's this cast that I saw. British playwright Jez Butterworth is wildly ambitious to write a three-act play with 22 characters, several of them children, one a baby, plus live animals on stage. It would be seemingly impossible to stage, but director Sam Mendes has done just that, creating a world that feels so real and authentic and Irish. The set transports one to a large rustic country kitchen, and the many children running up and down the stairs create a beautiful chaos. Two of Quinn's aunts and an uncle also live with them, one of them referred to as "Aunt Maggie Far Away" because she suffers from severe dementia that has her staring off into space much of the time, except for occasional visits to lucidity when she tells the children stories and possibly foretells the future. There are so many scenes and stories that don't seem to have anything to do with the main plotline and are just establishing character, which would be enough, but they're all meaningful and build up to the shocking conclusion of the play in ways you don't even realize. Hence the need to read it or see it again. This entire cast is marvelous, so many adorably precocious kids (if there's anything an audience loves more than a child swearing, it's a child swearing in an Irish accent), as well as really strong adult actors that portray both the joy of harvest day and the utter devastation of the situation. I would say that Brian D'Arcy James, who's mostly known for musicals, is going to win a Tony, except that he's a replacement so ineligible. But still, he gives Quinn such heart and strength, the loving head of the family with a dark past. Also wonderful are Emily Bergl as his ailing wife, Holley Fain as the new widow, Ralph Brown as the powerfully evil local head of the IRA, and really every member of this cast. Did I mention there's a baby?! Who almost stole the show every time he appeared on stage. The Ferryman is an epic play that's so dense and full of substance, but also incredibly engaging as you get caught up in the life of this family. The title of the play refers to a figure from The Iliad, the ferryman who carries souls across the River Styx into Hades, except those who were not buried. Bringing my 2019 NYC theater trip full circle from Hadestown to The Ferryman.